When I teach Brain Fit Now workshops I often share a startling fact about dementia. In a word, age. Unfortunately, it is the main risk factor for developing Alzheimer’s Disease. In fact, when it comes to dementia we are all at risk. Since this is part of the reality of living longer we need to prepare for living in a community with the condition. 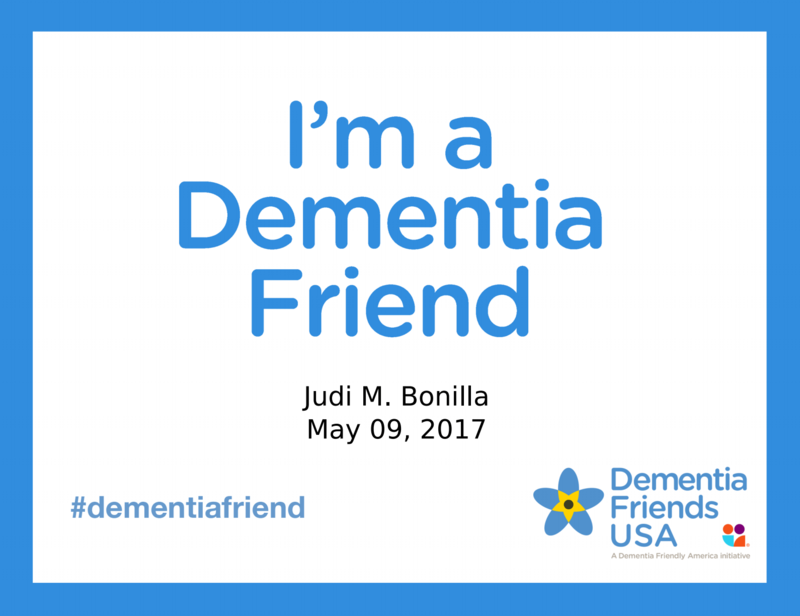 Recently, I learned about Dementia Friends USA. An online platform providing free real life tutorials on how you can help someone with dementia. By watching brief tutorials you can learn more about the condition. Equally important you will learn how to help someone in everyday situations. In particular, this includes banks, first responders, grocery stores, libraries, pharmacies, restaurants, and transportation. In essence, this is real life training for real life. It’s easy, quick, and more important it’s empowering knowing you can make a difference. Now is the time to join me and become a #DementiaFriend.